Show your team spirit with this 12” x 11” Texas Aggie throw pillow. Perfect for your favorite chair, sofa or the car. 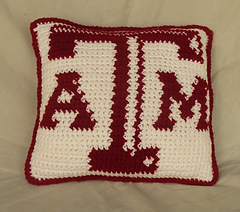 The nostalgic letterman jacket style pillow top makes a great gift for all the Aggies on your list. Pattern suitable for intermediate/advanced skills. Requires working knowledge of frequent inline color changes and reading and working from charts.